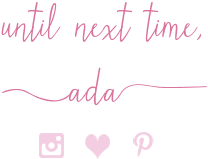 Welcome to an all new, beautiful, much improved and organized blog. Doesn't it look pretty and clean? If you are a first-time reader, I just had my entire blog re-designed. The lovely Ashley from The Grits Blog did it for me and made me such a happy girl. I was so happy to see it all come together. It is very me: clean, elegant, girly but not too much, in blush (Rose Quartz) and mint green with touches of red. I will talk about the blog design more throughout the week but for now just browse around, check it out and let me know what you think. =) So, yeah this was one of the big things I was working on lately, on top of a very busy personal work schedule, house issues and health issues for all of us as a family and horrible migraines I had to deal with. It has been such a hectic last few weeks. On top of that, we have had a lot of snow and my picture-taking has suffered from it. But you know: all is well that ends well. To celebrate this new design and 4 years of blogging (this Spring I am coming up on 4 years), I am also wearing new threads. It is great to start off a new month with something new and exciting like a blog re-branding and redesign. Plus the colors are perfect to kick off Spring. And yes, everything I am wearing is new, from head to shoe: from the Gorgeous DV Espadrille Flats, to my Jacquard Wrap Skirt, my Chiffon Blouse, the Foldover Clutch, this Gorgeous Colorblocked Blanket Scarf and all of my Jewelry courtesy of Rocksbox. And I am continuing my Blanket Scarf week and for the next three days I am joined by the Beautiful and Stylish Emily who blogs at Darling Dearest. This girl owns a ton of Blanket Scarves and always wears them with such an ease. She looks great here. A white background windowpane blanket scarf is one I need, too. I love how my New Colorblocked Blanket Scarf acts as a Winter Rainbow to my canvas of Neutrals: Navy, Camel, Off-White and Black. All my three new pieces of Rocksbox Jewelry this time around were in a gold tone with some gorgeous green stones so I paired them with more gold-tone jewelry, more green stones and a pop of red which brought out the red from the Blanket Scarf. Plus, with all the pops of green, I am not just hinting at Spring but it is a great idea to wear a little bit of Green for Saint Patrick's Day coming up. Though let's face it, we are covered under inches of snow and you can not see any green anywhere in the nature. Also, today I am co-hosting Monica's Weekly Linkup. Please make sure you follow Monica's Blog. She has really cute feminine style with a country flair and she is the best when it comes to painting+styling her nails and doing her hair. Rayne Necklace in Green: Kendra Scott Borrowed c/o Rocksbox (New) (identical), (same in light green), (similar, Steal). Viola Ear Jackets in Gold Tone: Gorjana c/o Borrowed c/o Rockbox (New) (identical for a Steal), (very similar), (gorgeous option, Great Deal, love these). Native Legend Cuff in Malachite (bright green): House of Harlow, Borrowed c/o Rocksbox (New) (identical, Steal), (similar, Great Deal, love this), (similar, small Splurge). In my second Rocksbox, I received one of those gorgeous Rayne Necklaces from Kendra Scott ($64.00 with the special price), a green stone triangle cuff by House of Harlow ($62.00 with the special price) and some Dangly Gold Earrings by Gorjana (they called them earring jackets but to me they weren't really jackets) ($52.00 with the special price). I had put the bracelet under my wish-list, so I was glad I received it. It is a very pretty bracelet and I wish I owned it but in my opinion it didn't justify the price. The Rayne Green-Stone Necklace was the item I made mine and I wouldn't mind owning it in another color too. The Earrings were my least favorite item. They were cute but nothing special and I thought they were very pricey for what they were. Just like the first time, my stylist this time had chosen 3 pieces that mixed+matched well together. I mean look at those 3 items above, it is like you are meant to always wear them together. F.Y.I. You can still use my special code to get a free month of Rocksbox jewelry delivered to your home: ADABFF39. It is a service I plan to continue at least for another month or two. It is fun. The Camel Espadrille D'Orsay Flats bring out the Camel from the Blanket Scarf and match the Sequined Bronze Bow Barrette nicely. And all the Gold Tone Jewels work with the Camel too. Also, a Red Elephant Charm Bracelet to match my Red Ruby Ring. Camel, Faux Leather, Woven, Espadrille D'Orsay Flats: DV via Target (New) (size up) (identical), (similar, Great Deal), (similar, Steal, love these). Silver+Gold Antique Ring w/ Large Oval Semi-Precious Lavender Stone: from my Grandma (similar, Splurge), (similar, love this). Gold Tone Stretchy Woven Bracelet w/ Red Enamel Elephant Charm (part of a 3-piece set): A Local Accessories Boutique (New) (similar, Splurge), (similar, Great Deal),(similar, Steal, love this). Sequined Bronze+Black Tuxedo Bow Barrette: Wal Mart (New) (very similar, Splurge), (similar, set of 3, Steal, love these). I added some of my own gold+green pieces to match the gold+green jewelry I received from Rocksbox. Don't the flower studs and flowers on the bracelet look like clovers? Gold-tone Thick Chain Bracelet w/ 2 Flower Charms: c/o A Local Accessories Boutique (New) (gorgeous option, Splurge), (similar, Great Deal). Gold+ Green Citrine Tennis Bracelet: JC Penney (similar, Splurge), (similar, Great Deal, love this), (similar, Steal). Silver Ring w/ large Square Citrine Stone: Meijer's (borrowed from Mom) (similar, Splurge), (similar, Great Deal), (similar, Steal, love this). Tiny, Bright Green Flower Studs: c/o A Local Accessories Boutique (New) (similar, small Splurge, love these), (very similar, Great Deal), (similar, Steal). Gray/Blue/Red/Camel Colorblocked Blanket Scarf: BP via Nordstrom (New) (similar, Splurge, love this), (similar, Great Deal), (similar, Huge Steal). Navy Faux Leather+Faux Shearling Foldover, Envelope Clutch: Old Navy (New) (similar, Splurge), (similar, Great Deal), (similar, Steal, love this). Navy+Black Jacquard Camouflage Wrap Skirt: Banana Republic (New) (identical, on sale), (similar, Splurge), (similar, Steal). Neutral Eye Shadow Palette: Clinique (identical + I love it), (similar by Clinique, Great Deal), (similar by Clinique, Steal), (similar, love & own this one, Fantastic Deal). Outlast, Long-Wear, Moisture Lipstick: Cover Girl in " Magnetic Mauve 945" (identical + I love it, Great Deal), (similar, Steal), (similar, Splurge). Black Opaque Tights: Old Navy (New) (similar, Splurge), (similar, Great Deal), (similar, Steal). Also linking up with the ladies of The Blended Blog. Their theme for this month's linkup is wraps/outer wear and I am themed all week for this prompt, so it's perfect. I am also linking up with Becky, Della, Rachel & Tiffany and their theme this month is "March Madness". While I do not have on a sporty or support-your-team look, I have on lots of Navy Blue which is University of Michigan's School Color and I proudly graduated from U of M.
Lastly I am linking up with Andrea, Dawn Lucy and the other ladies of "My Refined Style". If you made it this far, thank you so much for being here, for reading and for your support. Happy Hump Day to all and join Monica and I on our link-up below. We Bundle Up in Blanket Scarves. 1/6th of the year is gone, vanished. Oh my. Technically March is the first month of Spring (though not until three weeks from now) but from our warm, bundled up looks and blanket scarves you would think otherwise. Vivian and I bundled up today during a Snow Storm (IRL it is snowing quite a bit, though these photos are from a few weeks ago, when we had another snow). Speaking of March and Spring, in my home-town where I was born in Albania, March 1st is a holiday of sorts because we celebrate Spring Day. We make these special types of cookies, some warm drinks with liquor on them, a salty bread pudding which is amazing and the night before we go outside around a big fire which symbolizes letting go of Winter. Also, we put red+white braided bracelets in our wrists (made of thread). The white symbolizes the peace and joy that Spring brings, while the red symbolizes good health and wealth. I bet you didn't know this. You will learn more fun facts about me throughout the week because it will be a very special week on this little old blog of mine. Please stay tuned. I know it will not disappoint you. Vivian loves playing outside on the snow and we took these photos a few weeks ago before I headed to work around Valentine's Day, that is why we celebrated with a lot of Red (and some Hot Pink). My Scarf has Classic Americana Colors: Red, White and Blue, in an oversized Buffalo Plaid Print. It is so soft, big and well-made and I got it at Wal Mart. I paid full price for it (around 9 bucks!!) but they are now on clearance for around 5 bucks. I paired it with my new Olive Field Jacket from Old Navy which I wore over a Red Rose Feminine Blouse. On the bottom I have on Medium Wash Flares and my Black Leather Heeled Booties. I accessorized with super bright Neon Red Lipstick and my adorable Red Cable-Knit Beanie. Vivian matched me in her own Red Marled Beanie, her Hot Pink Heart-Print Puffer Coat, Gray+Coral Leopard Leggings, a Red Tutu and her White+Pink Sneakers. She has her own Blanket Scarf too. This Red+White Marled Infinity Scarf/Snood I originally purchased for me at Gap but Vivian has worn it more times than me, actually. It looks great on her. So, how are you and your tots bundling up during snow days? Wearing blanket scarves, too? Red/Navy/White Large Buffalo Plaid Wool-Blend Blanket Scarf: Wal Mart (New) (similar, small Splurge, love this), (similar, Great Deal), (similar, Steal). Medium-to-Dark Wash Blue Flare Jeans: American Eagle (very similar current option by AE, Steal), (very similar, Great Deal), (similar wide flares by Express, small Splurge, my favorite), (trouser option by Guess, love these). Bright Red Cable-Knit Wool-Blend Beanie: Target (similar, Splurge), (similar, Great Deal), (similar w/ pom, Steal, love this). Neon Orange-Red Matte Lipstick: Flormar (New) (very similar, Splurge), (similar, Great Deal), (similar, Steal, love this). Black, Pointy Toe Booties w/ Kitten Heels: Kenneth Cole (Borrowed from Mom) (similar, Splurge), (similar, Great Deal, love these), (similar, Steal). Pink+Hot Pink Heart Patterned Puffer Coat: Wal Mart. Red+Gray Marled Beanie: Handmade+Gifted (New). Red+White Marled Snood: Gap (New). Coral+Gray Floral Leopard Leggings: Little Lass. Lauren, Leeanne, Lindsey, Liz, Madeline, Monica, Rachel, Rebecca, Saumya, Sheela,Tara, Taylor, Two Peas, Victoria and Zaz. Also, linking up with The Blended Blog. They have a themed linkup each week and this week the theme is Wrap/Outer Layers. And stay tuned next week because Vivian and I will show you what we wore underneath these outerwear pieces. Also, come and link up with me tomorrow on Wednesday and also on Thursday. Thanks.